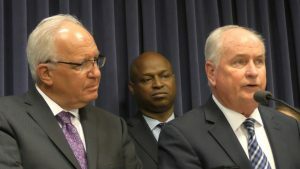 State Representative Dan Brady and fellow members of the bipartisan, bicameral Higher Education Working group Tuesday unveiled a series of proposals to strengthen Illinois colleges and universities, and to make them more affordable and more attractive to Illinois students. our students choose to attend college elsewhere. The proposal we are unveiling today are aimed at keeping our best and brightest here to complete their education, and then to put their skills to work in our communities,” Rep. Brady said. Representative Brady has assumed Chief Sponsorship of House Bill 4781 that allows the State Board of Education to survey Illinois students taking state assessment tests about their career interests, intended field of study and their cumulative GPA (grade point average). The survey results will be shared with all Illinois colleges and universities unless the student opts out.